I have been using Riptide and another organic based concentrate for my mosquito misting system that was professionally installed. However, I am not happy with the results (virtually no knockdown). Can you recommend a product you carry that would be the best bang for the buck? Based on what I have read on the youtube product comparisons of several brands, I am looking for a good blend of knockdown, residual and repellant effects. I am not sure if I am asking the right question but I sure can use some help. Here is the deal on Riptide. It is a naturally based pyrethrum - 6% and contains Piperonyl Butoxide - 25% (synergist to make it stronger). There is virtually nothing stronger on the market for mosquito control. It also has the least amount of plant burn compared to the other alternatives. Before Riptide was released several years ago, the standard in the industry was Pyronyl 303. Pyronyl 303 is 3% pyrethrum and 30% PBO. So the short answer is, that as far as anything stronger available? No. There are other products such as Vector Ban Plus that are synthetic or other EPA 25b list (green) registered for mosquito control such as Naprovit, but nothing as strong as Riptide. Here is what you need to do, and what most commercial misting companies will do - spray the yard with an insecticide product during the summer and fall months to keep the mosquito population at an acceptable level. Demand CS and also Nyguard (IGR) are great products to use in combination and will kill mosquitoes on contact and also provide some residual. Nyguard is a growth regulator and will help to keep any mosquitoes that might be breeding in the area to a minimum. You might need to apply it every 2-3 weeks. Other than this, Mosquito Barrier is Garlic and also provides some kill with repellency. 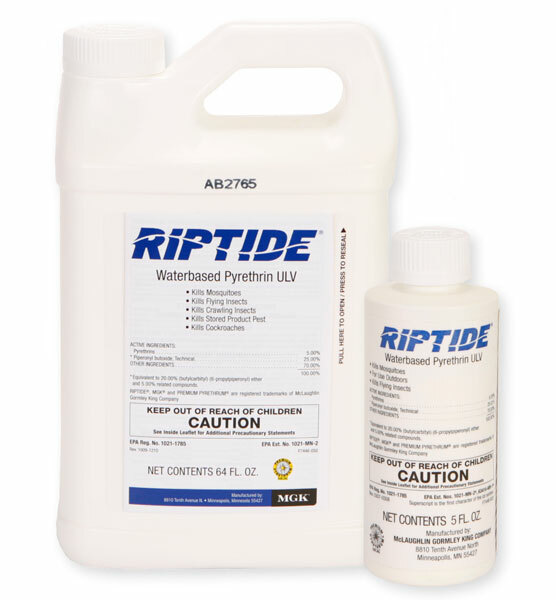 Keep the Riptide full strength, use an occasional yard treatment, an IGR and hopefully, this will solve the problem.